It has always been one of my great pleasures in running S2C to meet and get to know so many brave people facing up to some really tough situations and surviving as best they can. Sometimes I see them grow, go off and do better. Sometimes, because of their illness, they get worse and you can only support them as best you can. It was with great sadness this week we learned of the death of Christine from our Thursday Group after a short illness. What will remain with me is the great pleasure she derived from being with us in the sessions and creating alongside the other group members. On occasions she even was reduced to tears because she had to leave a session. Being in the group was for her a joy and relief that she could find friendship and support. We will miss her very much and our sympathy goes out to her husband and family. It then seems odd that all the other usual things went on at S2C. There were people I was concerned about, there were those who are moving on and getting jobs there were those that produced amazing artwork and there were those who left me frustrated! It certainly feels like the end of the year! Things slowing down or stopping for the holidays. People unable to come now as kids off school. I sit and watch people come and go in an endless escalator of those who need our support trundling by at different speeds then heading off when they reach the top. I think to all those we have helped in the past who are now getting on with their lives and especially to those who struggle or we have lost to their illness. On Friday we were visited by Tim Farron our local MP who has shown great support for mental health issues and championed the saving of the local psychiatric ward Kentmere. I am not a great communicator and never enjoy the pressing of flesh and all those things you need to do to talk to such people but he was very amiable and easy. Showing great interest and concern. It was good to see Tim roll up his sleeves and sit in the WellArt Group (though his art needs some work!). The visit, I think, achieved the aim of raising awareness of what we do and he did indeed appreciate the main thrust of it being about engagement and activity to support those in the care of the medical services. It was good to hear our service users talk honestly about how we had helped them. It always leaves me wishing we could do more but doing what we can will have to do for now! Its been a funny old week at Space2Create. In one sense hectic as we were down to the bare bones with our volunteers as an epidemic of illness, misfortune and commitments wiped them out! Thank you to everyone who was able to step in and help out. It is moments like that you really appreciate the support and hard work that people give. Last weekend was the Factory Open Studios with all the units and studios open for the public to come along and see what the artists and creative were up to. It was a good weekend for S2C with over 400 people visiting over the two days. What is nice about these events is that they visitors are coming specifically to look at art rather than ties when we do other events where people are just milling past randomly. Lots of great discussions and opportunities to spread the word about what we do. The exhibition “Imagine Senegal” by Claire Griffel has been doing very well and Claire has sold lots of pictures, cards and calendars which is great as all the proceeds will be split between a Senegal School project and Space2Create. Despite all the hectic goings on the usual air of relaxed fun and humour continued. One thing I have always loved about a Space2Create session is the way it unfolds. It’s not like being on a course or going to college where there is a focus on learning skills or techniques (though that is there too). There is a relaxed and welcoming air as people arrive, chatting and catching up, making drinks and gathering together to start (admittedly this part can sometimes be like herding cats). In this part there is usually laughter, sharing of news, support being given where needed. Then we start, again not in a college way but an idea being demonstrated, always free and easy as people see how they might take it in different directions but often with some new skill or idea or information about an artist or style. Then there is the hum of purpose as materials are gathered and creativity begins. \creating in the sessions is continuous but conversation and laughter ebb and flow, there might be a gentle hum of quietly shared conversation in pairs which gives way to a whole table discussion punctuated by hilarity. This might give way to silence, not one of those awkward silences, a creative quiet as everyone is lost to their own creative world. Then a comment and agin the room explodes into laughter. That is the sound of mutual support, friendship, understanding, shared experience and care. This week had some good bits and some bad bits! Having to cancel sessions is never good but it happens occasionally when you are totally reliant on volunteers (and even when you’re not!). S2C is great in that its service user led and supported by volunteers. Its weakness is that because its supported by volunteers from time to time personal illness, commitments and Jobs mean that they can’t volunteer. That’s not a bad thing and we should always be grateful for any time anyone can give. It is moments like that you would like to have the luxury of having a committed paid staff supported by volunteers supporting the service users. 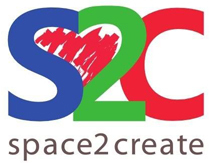 Space2Create ticks along on its funding but the difference in income required to do what we do now and to have two or three paid staff is literally a quadrupling of the income. Anyway, we can keep trying, growing and developing and maybe that will happen! On to the good stuff! After weeks of tree decoration making this week the team went off to Kendal Parish Church and decorated a tree with all the handmade recycled goodies to brighten up the festive fun. There are over 40 trees done by local organisations and raising money in the Church. Please do go along and see which you like the best (no pressure) and maybe make a donation to your favourite. Also this weekend is the Open Studios at The Factory. The Factory Studios are working hard to create a cultural centre and the addition of local bands, brass bands and street food mean you can have a great few hours out looking at a whole range of arts and crafts as well as buying some! In Unit 31 we have the exhibition “Imagine Senegal” by Claire Griffel raising funds for a twinning project as well as S2C. We are also running drop in print making sessions and making clay figures so all good fun to be had. Please come down and support us.